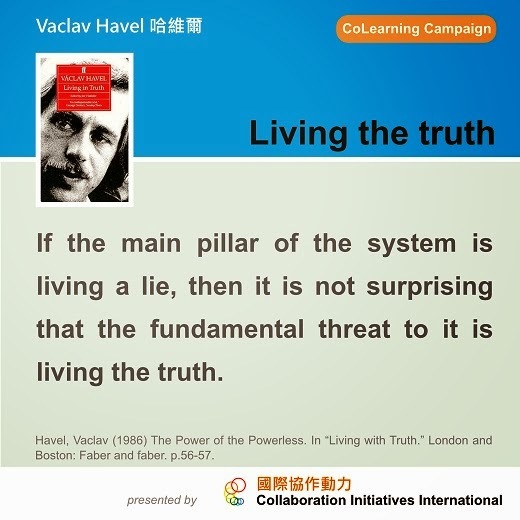 …Living with the lie can constitute the system only if it is universal. The principle must embrace and permeate everything. There are no terms whatsoever on which it can coexist with living within the truth, and therefore everyone who steps out of line denies it in principle and threatens it in its entirety. In the post-totalitarian system, therefore, living within the truth has more than a mere existential dimension (returning humanity to its inherent nature or a noetic dimension, revealing reality as it is), or a moral dimension (setting an example for others). It also has an unambiguous political dimension. If the main pillar of the system is living a lie, then it is not surprising that the fundamental threat to it is living the truth. This is why it must be suppressed more severely than anything else. Havel, Vaclav (1986) The Power of the Powerless. In “Living with Truth.” London and Boston: Faber and faber. p.56-57.